It is a cool, breezy afternoon in Scottsdale, Ariz., just hours before the President's State of the Union address on Wednesday, Jan. 27. And across from P.F. Chang's and Goldwater Bank on East Camelback Road, a merry band of approximately 30 Tea Party activists, upset with politicians of all stripes, but especially liberals, waved signs against health care reform and out-of-control federal spending. The conservative protesters unfurled their banners and hoisted placards that read "Give Harry the boot" (with a real boot as a prop; and that would be Harry Mitchell, the local Democratic Congressman) and "Stop the Corrupt Health Care Bill  Drug Test Congress." It's not a particularly large gathering for the group. Earlier protests by the Tea Party Patriots of Scottsdale have drawn more than 100 people, according a spokesperson for Mitchell, who was elected in 2006 to represent the 5th District, just east of Phoenix. Just the day before, Mitchell was being protested from the other side by about 100 prohealth care reform demonstrators who rallied in front of his district office with signs saying "Health Care Can't Wait" and "Public Option NOW!" "There is giant passion on both sides of the health issue and real angst about the economy," says Mitchell. A moderate Democrat who voted for the final House bill, he believes the current health care status quo is unsustainable. 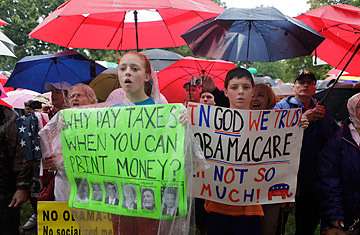 Still, the Tea Party folk are fervent. The group's event coordinator, Judy Hoelscher, is relatively new at all this and has the enthusiasm of a convert. When she was living in California, she voted for Gray Davis, a Democrat, for governor. Now she paints signs and has a website, angryrightwinghousewife.com. Hoelscher, a mother of three, says, "Obama and the Democrats have not addressed the economy at all." She believes the stimulus bill was nothing but a "slush fund." But she is also offended by Republicans and says she will work for Republican challenger J.D. Hayworth against incumbent Senator John McCain, who she says has been unresponsive to the "illegal immigration [that] is destroying the job market." Tom Jenney is the state director of Americans for Prosperity, formerly the Arizona Federation of Taxpayers. He helped organize the Tea Party tax-day rally on April 15 that drew more than 5,000 people to the state capitol, and he has been supporting various Tea Party groups around the state ever since. "If people show up and make a big ruckus, we can stop the health care takeover in Congress." Speaking through a bullhorn, Jenney asked drivers to honk if they want to stop health care reform. "I don't think the politicians have been listening," says Jerry Licata, a 61-year-old retiree who left New York for Phoenix 37 years ago. "The taxpayers have not been vocal enough before. They are just spending our money." Licata attended the Tea Party rally in Phoenix on April 15 and knew the cause was the right one for him. "That was it for me," says Licata as an 18-wheel Fed Ex truck sounds a loud horn in support of the Tea Party group. "I want the politicians to represent the people and not the special-interest lobbying groups," Hoelscher says. "That's the real issue for me. I am afraid for my children's future. My children absolutely deserve the same lifestyle as my parents." Honey Marques drives a white pickup truck with a bumper sticker, "Defend Liberty, Defeat Tyranny." But she is not a drive-by supporter. Marques, 34, is the president of the Scottsdale group and has been a devout conservative since discovering Rush Limbaugh while growing up on the Hawaiian island of Maui. She says, "We want limited government, fiscal responsibility, free-market principles and transparency. We are tired of government taking over our freedom." Marques, who attended the huge September 2009 Tea Party rally in Washington, believes that Obama's oratory and agenda will push the nation closer to socialism. A physician's assistant, she says, "We can use the market to bring health care costs down. Get government out of the way, then we can choose." The button on her black sweatshirt makes a similar point. It reads, "Tea Party Patriot," with an image of patriots throwing tea off the S.S. Obama. See the top 10 photos of the year. See pictures of Obama's first year in office.